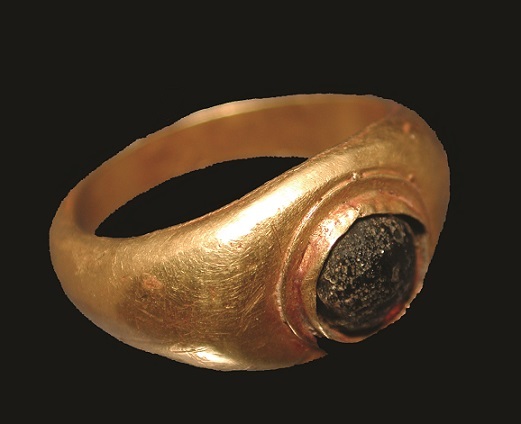 Description: Very fine intact gold finger ring with a plain, ruddy-colored stone, perhaps cabochon garnet. Plain, oval-sectioned hoop expanding to wide shoulders, and an oval flattened area centered with the stone set in a round bezel. 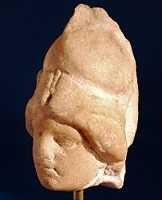 Worn by a child or young woman in antiquity. Condition: Intact. Surface of stone worn and possibly reset. A wonderful example of ancient jewellery. 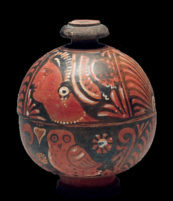 Provenance: Formerly in the collection of Carroll Wales, a distinguished Harvard-educated scholar and conservator who collected primarily from 1952-1970 during his extensive travels throughout the Middle East. Reference: See Classical Gold Jewellery and the Classical Tradition, Volume 5 by Jack Ogden (Society of Jewellery Historians 1991), p. 35, #5 and 6, for two comparative examples in the British Museum.